Another great coincidence !! Today is the birthday (1901) of Ubbe Eert “Ub” Iwerks, A.S.C. 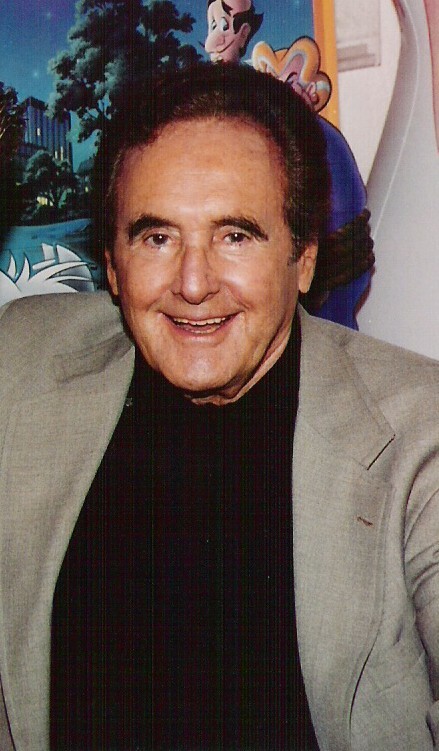 animator, cartoonist, character designer, inventor, and special effects technician, who created Oswald the Lucky Rabbit and Mickey Mouse with Walt Disney, and of Joseph Roland “Joe” Barbera (1911), animator, director, producer, storyboard artist, and cartoon artist, who worked with William Hanna to produce numerous classics, such as Tom and Jerry, The Flintstones, Yogi Bear, Scooby-Doo, Top Cat, The Smurfs, Huckleberry Hound and The Jetsons. The name Iwerks is hardly a household name in the way that Disney is, but I believe that Disney’s early success is greatly attributable to Iwerks. Disney was an entrepreneur with good ideas, but Iwerks was the one who turned the ideas into reality. Iwerks was one of Disney’s oldest friends, and spent most of his career with Disney. The two met in 1919 while working for the Pesmen-Rubin Art Studio in Kansas City, and eventually started their own commercial art business together. Disney and Iwerks then found work as illustrators for the Kansas City Slide Newspaper Company (later named The Kansas City Film Ad Company). 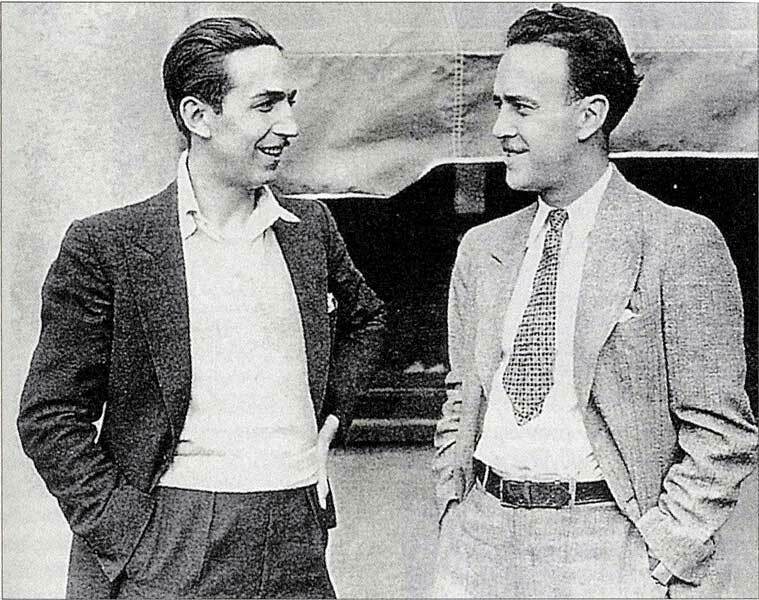 While working for the Kansas City Film Ad Company, Disney decided to take up work in animation, and Iwerks soon joined him. 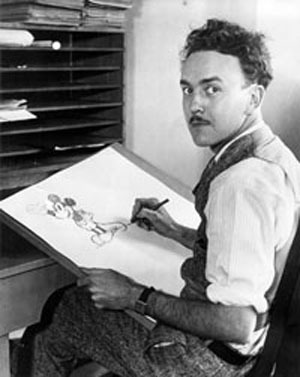 Iwerks was responsible for the distinctive style of the earliest Disney animated cartoons, and was also responsible for designing Mickey Mouse. In 1922, when Disney began his Laugh-O-Gram cartoon series, Iwerks joined him as chief animator. The studio went bankrupt, however, and in 1923 Iwerks followed Disney’s move to Los Angeles to work on a new series of cartoons known as “the Alice Comedies” which had live action mixed with animation. After the end of this series, Disney asked Iwerks to come up with a new character. 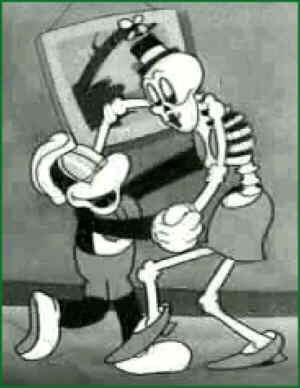 The first Oswald the Lucky Rabbit was animated entirely by Iwerks. 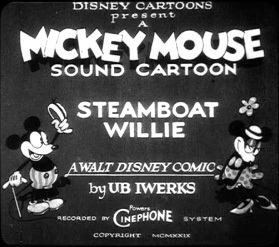 Following the first cartoon, Oswald was redesigned on the insistence of Universal, who agreed to distribute the new series of cartoons in 1927. In the spring of 1928, Disney lost control of the Oswald character, and much of his staff was hired away; Disney left Universal soon afterwards. He promised never to work with a character he did not own ever again. Disney asked Iwerks, who stayed on, to start drawing up new character ideas. Iwerks tried sketches of frogs, dogs, and cats, but none of these appealed to Disney. A female cow and male horse were created at this time by Iwerks, but were also rejected. They would later turn up as Clarabelle Cow and Horace Horsecollar. Iwerks eventually got inspiration from an old drawing. In 1925, Hugh Harman drew some sketches of mice around a photograph of Walt Disney. Then, on a train ride back from a failed business meeting, Walt Disney came up with the original sketch for the character that would eventually be called Mickey Mouse. Afterwards, Disney brought the sketch to Iwerks. In turn, he drew a more clean cut and refined version of Mickey, but one that still followed the original sketch. The Iwerks Studio opened in 1930. 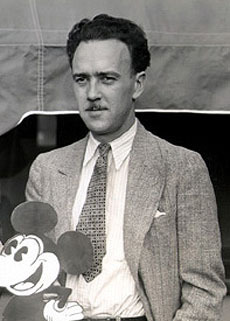 Financial backers led by Pat Powers suspected that Iwerks was responsible for much of Disney’s early success. However, while animation for a time suffered at Disney from Iwerks’ departure, it soon rebounded as Disney brought in talented new young animators. Despite a contract with MGM to distribute his cartoons, and the introduction of a new character named “Flip the Frog”, and later “Willie Whopper”, the Iwerks Studio was never a major commercial success and failed to rival either Disney or Fleischer Studios. 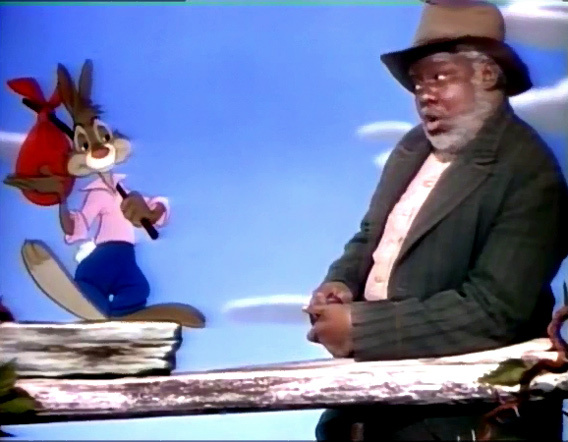 The Flip & Willie cartoons were later distributed on the Home-Movie market by Official Films in the 1940s. From 1933 to 1936, he produced a series of shorts (independently distributed, not part of the MGM deal) in Cinecolor, named ComiColor Cartoons. The ComiColor series mostly focused on fairy tales with no continuing character or star. Later in the 1940s, this series would receive home-movie distribution by Castle Films. Cinecolor produced the 16mm prints for Castle Films with Red emulsion on one side and Blue emulsion on the other. Later in the 1970s Blackhawk Films released these for home use, but this time using conventional Eastmancolor film stock. They are now in the public domain and are available on VHS and DVD. 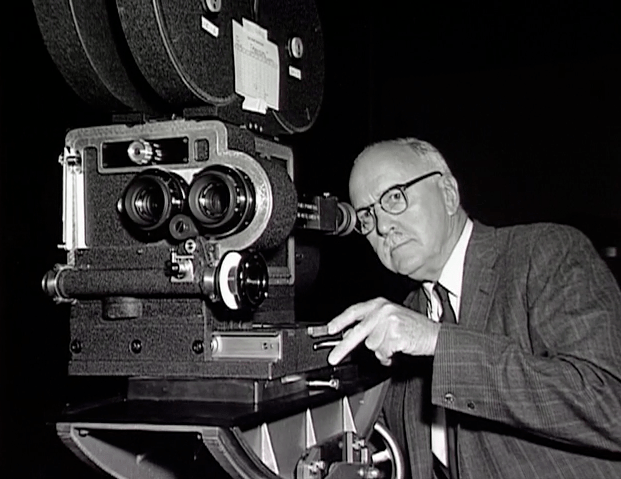 He also experimented with stop-motion animation in combination with the multiplane camera, and made a short called The Toy Parade, which was never released in public. In 1936, backers withdrew financial support from the Iwerks Studio, and it folded soon after. In 1937, Leon Schlesinger Productions contracted Iwerks to produce four Looney Tunes shorts starring Porky Pig and Gabby Goat. 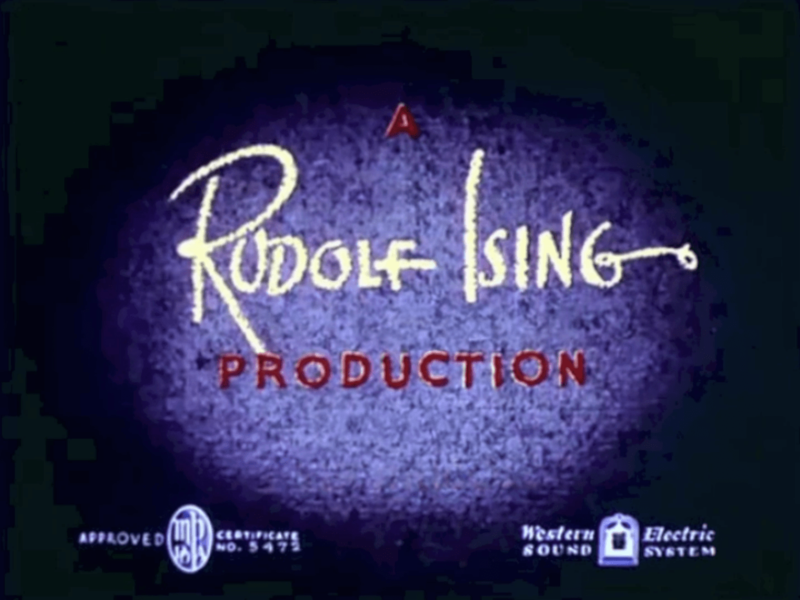 Iwerks directed the first two shorts, while former Schlesinger animator Robert Clampett was promoted to director and directed the other two shorts before he and his unit returned to the main Schlesinger lot. Iwerks then did contract work for Screen Gems (then Columbia Pictures’ cartoon division) where he was the director of several of the Color Rhapsodies shorts before returning to work for Disney in 1940. After his return to the Disney studio, Iwerks mainly worked on developing special visual effects. He is credited as developing the processes for combining live action and animation used in Song of the South (1946), as well as the xerographic process adapted for cel animation. He also worked at WED Enterprises, now Walt Disney Imagineering, helping to develop many Disney theme park attractions during the 1960s. 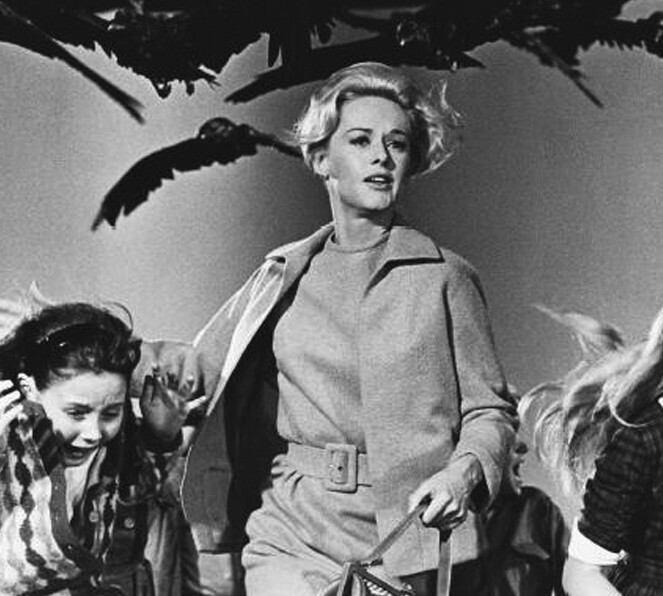 Iwerks did special effects work outside the studio as well, including his Academy Award nominated achievement for Alfred Hitchcock’s The Birds (1963). Iwerks’ most famous work outside creating and animating Mickey Mouse was Flip the Frog from his own studio. Iwerks was known for his fast work at drawing and animation and his wacky sense of humor. Animator Chuck Jones, who worked for Iwerks’ studio in his youth, said “Iwerks is Screwy [Skrewi] spelled backwards.” Iwerks died in 1971 of a myocardial infarction in Burbank, California, aged 70. During high school, Barbera worked as a tailor’s delivery boy. During the Great Depression, he tried unsuccessfully to become a cartoonist for a magazine called The NY Hits Magazine. He supported himself with a job at a bank, and continued to pursue publication for his cartoons. His magazine drawings of single cartoons, not comic strips, began to be published in Redbook, Saturday Evening Post, and Collier’s—the magazine with which he had the most success. Barbera also wrote to Walt Disney for advice on getting started in the animation industry. Disney wrote back, saying he would call Barbera during an upcoming trip to New York, but the call never happened. Barbera took art classes at the Art Students League of New York and the Pratt Institute and was hired to work in the ink and paint department of Fleischer Studios. In 1932, he joined the Van Beuren Studios as an animator and storyboard artist. He worked on cartoon series such as Cubby Bear and Rainbow Parades, and Tom and Jerry. 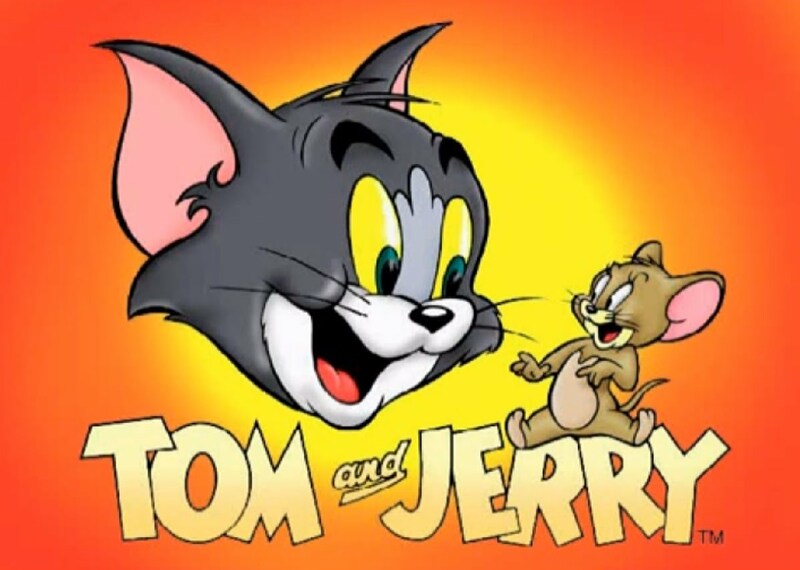 This Tom and Jerry series starred two humans; it was unrelated to Barbera’s later cat-and-mouse series. When Van Beuren closed down in 1936, Barbera moved over to Paul Terry’s Terrytoons studio. Lured by a substantial salary increase, Barbera left Terrytoons and New York for the new Metro-Goldwyn-Mayer (MGM) cartoon unit in California in 1937. He found that Los Angeles was suffering just as much from the Great Depression as Brooklyn and almost returned to Brooklyn. Barbera’s desk was opposite that of William Hanna. The two quickly realized they would make a good team. By 1939, they had solidified a partnership that would last over 60 years. Barbera and Hanna worked alongside animator Tex Avery, who had created Daffy Duck and Bugs Bunny for Warner Bros. and directed Droopy cartoons at MGM. 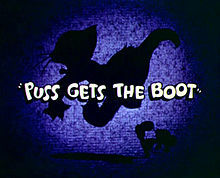 In 1940, Hanna and Barbera jointly directed Puss Gets the Boot (produced by Rudolf Ising and Fred Quimby), which was nominated for an Academy Award for Best (Cartoon) Short Subject. The studio wanted a diversified cartoon portfolio, so despite the success of Puss Gets the Boot, Barbera and Hanna’s supervisor, Fred Quimby, did not want to produce more cat and mouse cartoons believing that there were already enough cartoons of those in existence. Surprised by the success of Puss Gets the Boot, Barbera and Hanna ignored Quimby’s resistance and continued developing the cat-and-mouse theme. By this time, however, Hanna wanted to return to working for Ising, to whom he felt very loyal. Barbera and Hanna met with Quimby, who discovered that although Ising had taken sole credit for producing Puss Gets the Boot, he never actually worked on it. Quimby then gave Hanna and Barbera permission to pursue their cat-and-mouse idea. The result was their most famous creation, Tom and Jerry. Modeled after the Puss Gets the Boot characters with slight differences, the series followed Jerry, the pesky rodent who continuously outwitted his feline foe, Tom. 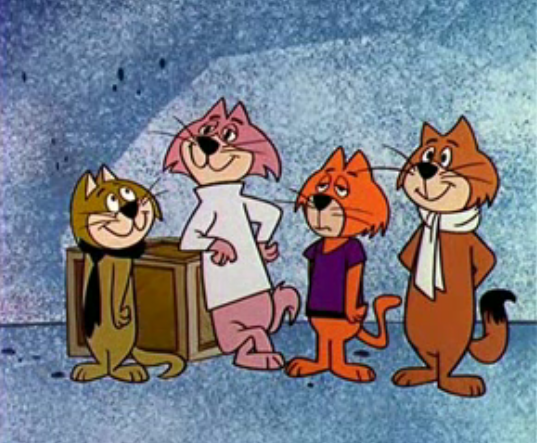 Hanna said they settled on the cat and mouse theme for this cartoon because “we knew we needed two characters. We thought we needed conflict, and chase and action. And a cat after a mouse seemed like a good, basic thought.” The revamped characters first appeared in 1941’s The Midnight Snack. Over the next 17 years, Barbera and Hanna worked exclusively on Tom and Jerry, directing more than 114 popular cartoon shorts. During World War II, they also made animated training films. Tom and Jerry was ultimately nominated for 14 Academy Awards, winning 7. No other character-based theatrical animated series has won more awards, nor has any other series featuring the same characters. 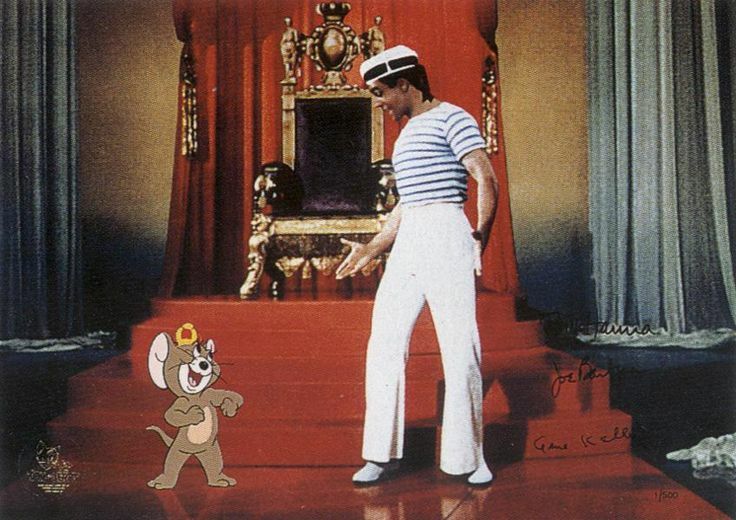 Tom and Jerry also made guest appearances in several of MGM’s live-action films, including Anchors Aweigh and Invitation to the Dance (1956) with Gene Kelly, and Dangerous When Wet (1953) with Esther Williams. Quimby accepted each Academy Award for Tom and Jerry without inviting Barbera and Hanna onstage. The cartoons were also released with Quimby listed as the sole producer, following the same practice for which he had condemned Ising. Quimby once delayed a promised raise to Barbera by six months. When Quimby retired in late 1955, Hanna and Barbera were placed in charge of MGM’s animation division. As MGM began to lose more revenue on animated cartoons due to television, the studio soon realized that re-releasing old cartoons was far more profitable than producing new ones. In 1957, MGM ordered Barbera and Hanna’s business manager to close the cartoon division and lay off everyone by a phone call. Barbera and Hanna found the no-notice closing puzzling because Tom and Jerry had been so successful. Barbera’s first foray into television was a 1957 collaboration with Robert D. Buchanan on Colonel Bleep. The series, the first ever cartoon produced specifically for color television, featured some of the futuristic designs and limited animation Barbera later carried over to his other television productions. Barbera’s involvement in Colonel Bleep (and with Buchanan) was short-lived; his only known credited involvement was a creator credit. In 1957, Barbera teamed again with his former partner Hanna to produce cartoon films for television and theatrical release. As they had at MGM, the two brought their different skills to the company; Barbera was a skilled gag writer and sketch artist, while Hanna had a gift for timing, story construction, and recruiting top artists. Major business decisions were made together, though each year the title of president alternated between them. A coin toss determined that Hanna would have precedence in the naming of the new company: first called H-B Enterprises but soon changed to Hanna-Barbera Productions. Barbera and Hanna’s MGM colleague George Sidney, the director of Anchors Aweigh, became the third partner and business manager in the company, and arranged a deal for distribution and working capital with Screen Gems, the television division of Columbia Pictures, who took part ownership of the new studio. The first offering from the new company was The Ruff & Reddy Show, a series which detailed the friendship between a dog and cat. 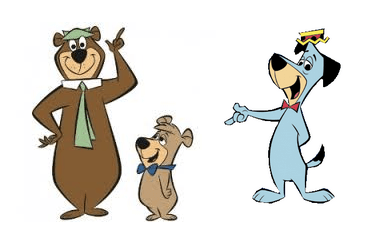 Despite a lukewarm response for their first theatrical venture, Loopy De Loop, Hanna-Barbera soon established themselves with two successful television series: The Huckleberry Hound Show and The Yogi Bear Show. A 1960 survey showed that half of the viewers of Huckleberry Hound were adults. This prompted the company to create a new animated series, The Flintstones. A parody of The Honeymooners, the new show followed a typical Stone Age family with home appliances, talking animals, and celebrity guests. With an audience of both children and adults, The Flintstones became the first animated prime-time show to be a hit. Fred Flintstone’s signature exclamation “yabba dabba doo” soon entered everyday usage, and the show boosted the studio to the top of the TV cartoon field. The company later produced a futuristic version of The Flintstones, known as The Jetsons. Although both shows reappeared in the 1970s and 1980s, The Flintstones was far more popular. 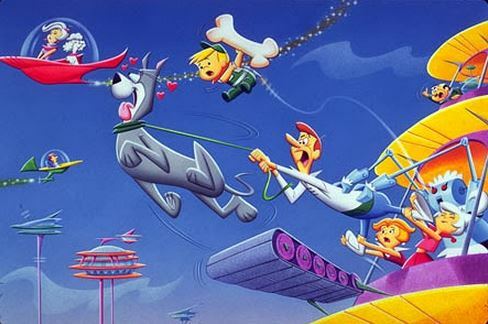 I much preferred The Jetsons. 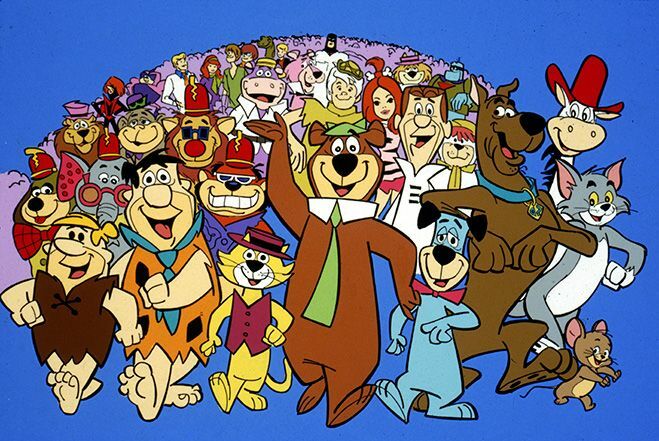 By the late 1960s, Hanna-Barbera Productions was the most successful television animation studio in the business. The Hanna-Barbera studio produced over 3000 animated half-hour television shows. Among the more than 100 cartoon series they produced were The Quick Draw McGraw Show, Top Cat, Jonny Quest, The Magilla Gorilla Show, The Atom Ant/Secret Squirrel Show, Scooby-Doo, Super Friends, and The Smurfs. The company also produced animated specials based on Alice in Wonderland, Jack and the Beanstalk, and Cyrano de Bergerac, as well as the feature-length films Charlotte’s Web and Heidi’s Song. As popular as their cartoons were with 1960s audiences, they were disliked by artists. Television programs had lower budgets than theatrical animation, and this economic reality caused many animation studios to go out of business in the 1950s and 1960s, putting many people in the industry out of work. 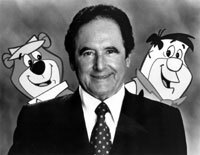 Hanna-Barbera was key in the development of an animation technique known as limited animation, which allowed television animation to be more cost-effective, but often reduced quality. 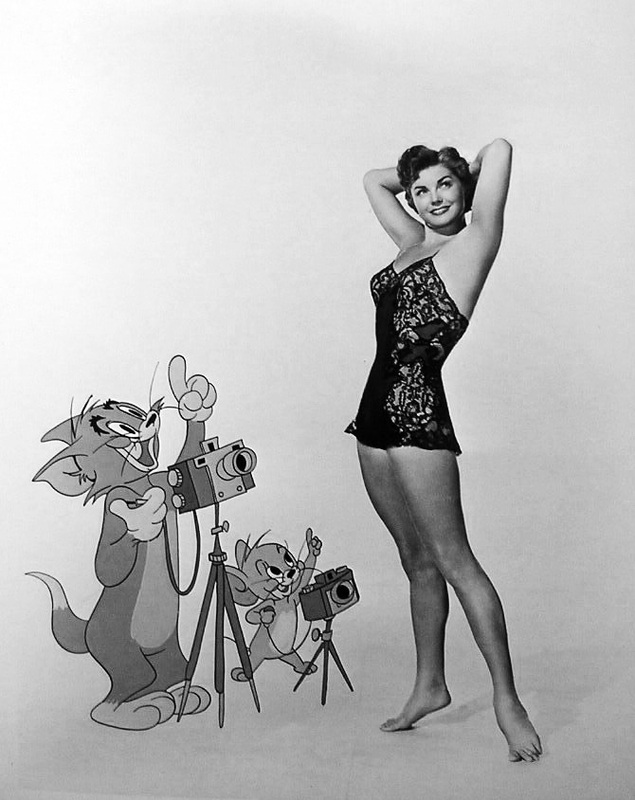 Hanna and Barbera had first experimented with these techniques in the early days of Tom and Jerry. To reduce the cost of each episode, shows often focused more on character dialogue than detailed animation. The number of drawings for a seven-minute cartoon decreased from 14,000 to nearly 2,000, and the company implemented innovative techniques such as rapid background changes to improve viewing. Critics criticized the change from detailed animation to repetitive movements by two-dimensional characters. Barbera once said that their choice was to adapt to the television budgets or change careers. The new style did not limit the success of their animated shows, enabling Hanna-Barbera to stay in business, providing employment to many who would otherwise have been out of work. In December 1966, Hanna-Barbera Productions was sold to Taft Broadcasting (renamed Great American Communications in 1987) for $12 million. Barbera and Hanna remained at the head of the company until 1991. At that point, the company was sold to the Turner Broadcasting System for an estimated $320 million. Turner began using Hanna-Barbera’s television catalog as material for its new Cartoon Network cable channel in 1992, and by the mid-1990s Hanna-Barbera was producing several original series for Cartoon Network, among them Dexter’s Laboratory and The Powerpuff Girls. In 1996, Turner merged with Time Warner, owners of Warner Bros., who would eventually absorb Hanna-Barbera into Warner Bros. Animation. After Hanna’s death from throat cancer in March 2001, Hanna-Barbera was absorbed into Warner Bros. Animation, with the unit dedicated to the Cartoon Network original series spun off into Cartoon Network Studios. Barbera died from “natural causes” at age 95 at his home in Studio City, Los Angeles on December 18, 2006. He is buried in a private section of the Great Mausoleum in Forest Lawn Memorial Park, Glendale. The blog gives great detail. In essence you begin by making a piperade by roasting bell peppers; then making a stewed sauce with onions, garlic, tomatoes thyme, parsley and bay leaf, plus the peppers, which you then purée. Next you thinly slice zucchini, yellow squash, eggplant, and tomatoes, and layer them in alternating slices over the piperade in a roasting pan. Drizzle with olive oil seasoned with garlic and thyme, cover with parchment paper and bake until vegetables are tender when tested with a paring knife, about 2 hours. 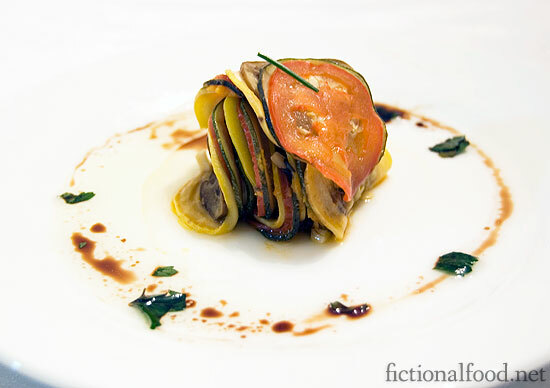 Serve as shown with a vinaigrette of the piperade, olive oil, vinegar, herbs, and salt and pepper drizzled around the plate.